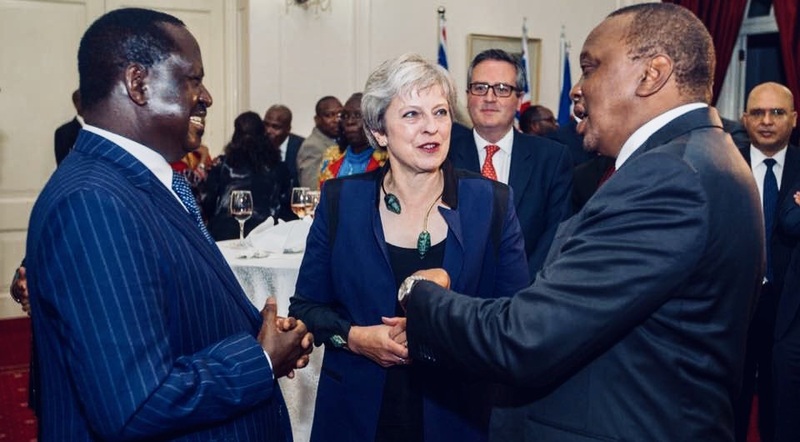 Friday August 31, 2018 - President Uhuru Kenyatta hosted a banquet yesterday in honour of the visiting British Prime Minister Theresa May with Opposition leader Raila Odinga at State House as part of the guests who were invited. Raila Odinga, who had travelled to Germany one week ago, rushed back to Kenya to honour Uhuru’s State House invite, where he joined the President, his Deputy William Ruto and Chief Justice David Maraga for a banquet in honour of the British PM. Earlier, Theresa May and President Kenyatta were at Strathmore University, Nairobi, for a networking forum of business delegates from both countries. “British companies are known for their high quality standards and strict adherence to labour laws which are hallmarks of fair trade,” May said. “To harness their potential, the young people need access to food and well paying jobs which can only be achieved through private sector involvement.” May added. On his part, President Kenyatta assured the private sector of his commitment and support in creating a conducive business environment. “With the Big 4 agenda in place, my Government is ready to offer any support to any investor willing to venture into any of the sectors involved including manufacturing so as to move this country’s exports up the value chain and supplement our existing export offerings,” Uhuru said.